Liberia's Former President Ellen Johnson Sirleaf "Do I look like somebody to say I'm 80 years [and that] I cannot remember? Come on." 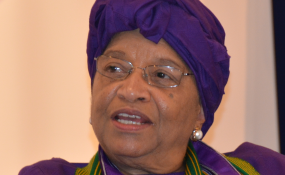 Former President of Liberia, Ellen Johnson Sirleaf at 80: "Do I look like somebody to say I'm 80 years [and that] I cannot remember? Come on." Ellen reacts to statement attributed to her that she's "80 years old and cannot remember anything"
Former President Ellen Johnson Sirleaf has dismissed reports claiming that she told investigators of the alleged missing L$16 billion that she is 80 years old and cannot remember anything. In a BBC interview with Jonathan Paye-Layleh about the statement attributed to her, which has been trending on social media, Madam Sirleaf categorically denied ever making any statement of such, describing the article as "tricky propaganda." "Anybody who said that, needs to go and look at themselves. Do I look like somebody to say I'm 80 years [and that] I cannot remember? Come on. You have a foolish paper here that is always doing sensational things, and those sensational things are not true. So we are accustomed to that," Madam reacted. "There is absolutely no fact to that," she continued. "I am very strong, my mind is functioning well and so that's tricky propaganda and nobody should listen to that." The former President explained that when she met with the investigative team, she told them everything she knows about the alleged missing billions. "There were some investigators that came to see me and I told them: everything I do, every decision I have made, every action I have taken, is not by word of mouth; is by paper, is by document. Anybody wants to know anything that I've done, please go to the records of the Ministry of State. It's written there and they will get full clarification on anything. Because I don't just talk, I write anything I do. So if somebody says that I said, I don't have to talk because it's written! Go and read the records and if you need clarification of the records, then you come back to me." she told the BBC. In a related development, the former President yesterday celebrated in grand style her 80th birthday at her Fish Market, Sinkor residence, nine months after she turned power to President George Weah, who led an array of government officials, to the former President's natal day celebration. The guests were entertained to a round of laughter when they saw Madam Sirleaf on the dance floor with her elder sister, Jenneh Bernard, partying to their favorite Oldies and Goodies tunes, including "Happy Birthday" by the late Prince Nico and the Rocafil Jazz band. This year's celebration of the Madam Sirleaf's 80th birthday coincided with her induction into the International Women's Forum (IWF) Hall of Fame, held in Florida, U.S.A. Madam Sirleaf was inducted alongside Alice Walton, Coretta Scott King, Rosa Parks, Wangari Maathai and Ruth Baders Ginsburg. This is the second international highest honor Madam Sirleaf has received so far since she stepped down as President of Liberia at the end of her second term in January this year.